Aurelia Marcella is a young Roman woman who manages a staging post, The Oak Tree Mansio, on the main road north for her brother, Lucius Aurelius Marcellus, who is a member of the secret services for the Roman army. Their sister, Albia, shares the responsibility with Aurelia, each have complementary talents that have created a successful business. They have resettled in this far outpost of the empire after their father, their home and all their belongings were lost in the destruction caused by the volcanic eruption at Pompeii. The local area seems very settled, the population working well with the invaders despite the fact that their religion led by the Druids, has been declared illegal and replaced by Roman gods. 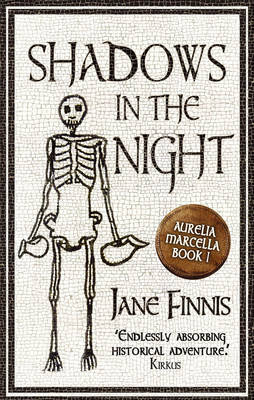 However, when a Roman who has been badly beaten and close to death is found in the courtyard with a message threatening all Romans with death, Aurelia starts to question their safety and their future. The Roman is a mystery, with two sets of official identification apparently in the same line of business as Lucius. Cousin Quintus, as he becomes known to them, slowly recovers and admits that his mission is to investigate reports of resistance with the added concern about support from some local Romans. As the attacks increase, Aurelia and some of the local business people get together to investigate the murders and especially the leader of a growing resistance group calling himself the "shadow of death". Aurelia finds herself at the centre of the storm, under personal attack and closely working with Cousin Quintus to trace the leader of the resistance and to restore security for themselves and the locals. Set in the northern part of Roman Briton, just fifty years after the invasion, this is an interesting and engaging thriller. The characters are well-drawn and it is obvious that the writer has a great deal of knowledge of the period and the area. However, unlike so many historical novels, the author doesn't feel it necessary to impose on the reader everything they know with the result that the level of detail and background feel just right. I found the book very compelling, and didn't want to put it down. Even my husband, who doesn't usually read thrillers or crime novels, but who is knowledgeable of Roman history, thoroughly enjoyed the book. Recommended as a good read.